Protect yourself from unsafe water even in emergencies! 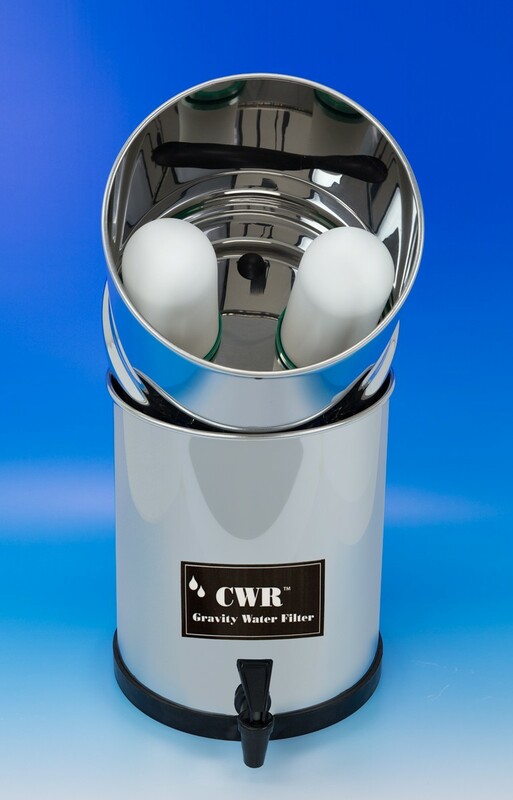 The CWR is a stand-alone unit for use when you don’t have access to running water. Simply pour water into the filter and it drips down into the chamber. The world-class UltraGrav ceramic "Metalgon" cartridge plus granulated carbon significantly decrease chlorine, chloramine, chemicals, dirt, sediment, bad taste and—most important when you are using surface water or water from an outdoor spout—parasites and bacteria. The UltraGrav's patented media even removes toxic heavy metals (including lead) and fluoride, a feature that standard ceramics do not have! Silver is baked into the ceramic cartridges to inhibit bacteria growth during storage. Measures 16¼" high x 7 1/2" in diameter; collapses down to 11 3/4" for easier storage and transport. Made of stainless steel with water spout. Output is a half-gallon per hour. The unit can hold 1 1/2 gallons at one time. The two included filters will last for approximately 1,200 gallons. Also available in a larger, 2-gallon size. Short of getting a whole house filter (in a rental), I tried everything from Doulton to Aquasana, which ended up in the bathroom. Unpalatable. High level chloramine and other contaminants in Los Angeles municipal water, though as far as I could tell, not much flouride. I don't know if it's the flouride filtering (our first), but the thick plaque on the dog's teeth that started upon move to LA is quite literally dissolving. He'll have no plaque within 90 days. 1200 gallons is a fair price, but note: the flouride and heavy metal filtering only last the first 300. So far, though, this is the only filter I can recommend (sent back the Berkey). I have two regular filters and fill it up every other night. It is slow with this water, but it does actually filter! Thanks Cutting Edge.